I like Zima. I like Zima and I like to put fruit in Zima. I like Zima because it tastes fruity and sparkley and I'm sure that when unicorns cry, they cry Zima tears. 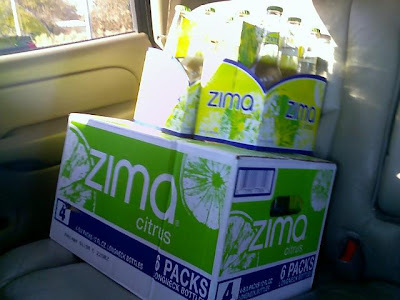 I recently cried when I found out that the unicorns had ceased to produce tears and therefore Zima had halted production. My sister also loves Zima so I called her immediately. The phone didn't even ring once because she had picked it up right as I dialed the last number, feeling a ripple in the force. She asked me, "Did someone in the family die?" I said, "No, it's worse," and I told her and she didn't say anything for a little bit before hanging up. She had traveled in the four state region, collecting Zima from High School parties and under the beds of shamed fraternity brothers. Her collection is not large and someday she will drink the Last Zima. I hope I am there to witness. "I'm sure that when unicorns cry, they cry Zima tears." Funniest thing I've read in weeks!